Development of fine motor skills and pselaphesia is a great motivation to improve perception, attention, mentality, speech, coordination of movements, imagination and memory. There are a lot of different methods which are focused on the development of fine motor skills. All of them require additional facilities and devices. One of them is Lyapko Needle Ball Applicator. Particularities of construction, reflexive mechanical and galvanic-electric properties of Lyapko applicators allow to achieve good therapeutic effect. Application of Lyapko applicators helps to activate nervous, cardiovascular, skeletal, digestive, immune and other systems. Reflexive-mechanical impact is outer multiple needle acupuncture of the definite areas and biologically active parts (BAP), micro massage of the skin and hypodermic tissues. Central parts must be well-activated. Definite areas of skin are connected with certain internals through the receptors and nerve fibres. When we influence on skin, we treat internals which are connected with it. When applicators are applied, a body starts revealing its `internal medicines`. It helps to improve blood circulation, to enhance metabolism and recovery processes, to remove pain, to reduce edema , etc. It`s the natural health improvement of the body. Galvanic-electric impact helps to improve metabolism, to enhance recovery processes, to produce biologically-active substances, to remove pain and exclude the cause of the pain. It appears in the result of skin and applicator needles interconnection. At contact with the skin many physical-chemical changes take place on the surface of applicators` needles. These changes are peculiar to the changes under the influence of direct current. The oxide layer is formed on needles and galvanic effect appears. Electric micro currents appear in the skin on the ends of the multilayer needles as well as between needles which are made of different metals. By means of microionophoresis the required metals are transferred into liquid organism`s media. These micro elements are very important for normal work of all vitals and systems. Immunological response: stimulation of humoral and tissue links of immunity increases the level of immune protection and level of adaptation to the pathogenic influence. How to use Lyapko Needle Ball Applicator. At disorders of nervous system conduction and psychic activity it is recommended to influence on palms and feet, which are projection zones of all vitals and systems of a body. Such local influence helps to develop fine motor skills and pselaphesia, promotes development and repairment of brain functions. Lyapko Needle Ball Applicator is good for use in `finger gymnastics`. It is widely used by pediatric psychologists, valeologists, logopedists, recreation therapists, neurologists and speech pathologists. In other words it is used by doctors who work with children suffering from speech delay, psychomotor development, neurodevelopmental and neuromuscular delays, logospasms, ICP and other diseases. to reveal tiredness and pain of brachium which are caused by long training; to cope with stress (there are a lot of teleneurons and biological active points in the palms; influencing on them the feel of relaxation is usually achieved). 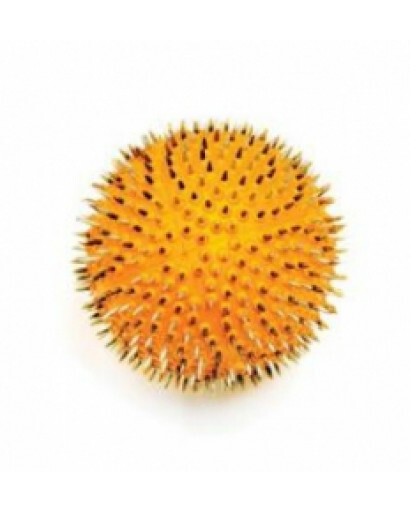 To reveal pain and to achieve the effect of inhibition influence with Lyapko Needle Ball Applicator on pain areas and problem points from the center to the periphery. Influence counter-clockwise during 15 – 20 minutes. To achieve the effect of stimulation influence the points of gross spectrum. Influence clockwise during 7 - 10 minutes from the center to the periphery. Lyapko Needle Ball Applicator is a device of intense influence on the pain areas and on problem points of the person`s body. If there is a point of tenderness in lumbosacral of spinal cord, you can lie with all your body on Lyapko Needle Ball Applicator. Put bolster or roller under opposite symmetrical side to reduce the pressure. It is possible to carry out orthopedic alignment influencing the cramped muscles. For toning effect influence with Lyapko Needle Ball Applicator in the direction of the energy movement along the channels. Effect during 7 – 10 minutes until light hypermia appears. To get sedative effect influence against energy movement along the channels. Effect during 10 – 15 minutes until strong hypermia appears. First aid. At emergency (loss of consciousness) influence with Lyapko Needle Ball Applicator on tips of the fingers of hands and legs, on earlob and on a tip of the nose. Procedure duration is 20 seconds with a pause of 15 seconds. Carry this procedure out 2 or 3 times. At pain syndrome Lyapko Needle Ball Applicator should be applied on the point of tenderness or on the correspondent to the problem point (follow the schemes of acupoints placement). Procedure duration is 5 – 10 – 20 minutes. At trifacial neuralgia, sympathalgia and toothache use Lyapko Needle Ball Applicator additionally on the most painful zones (10 – 30 minutes) and on symmetrical zones (2 – 5 minutes). Influence also on the earlob of the healthy side. Cardialgia (heartache) as a rule is followed by osteohondrosis of cervical and thoracic spines. Influence on points of tenderness in the zone of breast, paravertabral zone, projection zone of hands and feet. In order to enhance the effect symmetrical zones and points of opposite side should be also influenced. For instance, pain zone is on the left – influence on the right. 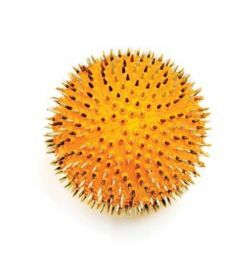 Lyapko Needle Ball Applicator can be successfully used for supporting of body by influencing with it on biologically active zones of organs correspondence on palms according to Su Jok therapy. Have you any problems with any vitals? Examine carefully a picture with the scheme of points on the hands and feet and vitals correspondence. Identify zone with a point which is correspondent to the aching vital. Apply Lyapko Needle Ball Applicator to this zone and press it, influence with massaging actions. If you massage regularly chosen zone on hands and feet, you can significantly improve the state of aching vital.